Up early for our day in Boston, we came downstairs to the busy foyer and stood in queues for the first hot breakfast buffet of our entire stay. Since it was a decent breakfast, we made sure we all ate our fill, even though it was tough getting a table. I enquired at the desk about transport into Boston city, and was told that there was a train terminal close by, but not close enough to walk to, and we'd have to wait for their courtesy shuttle bus to take us there. We didn't fancy all those connections, and decided to risk driving into the town and parking. When we got into town, we followed the signs for parking and eventually decided to go for an obvious multistorey near the dockside. We were horrified to see that the parking was going to cost $35 for a day, but decided that we were only here for one day it would be silly to grudge paying what was less than £20 for the convenience of being in town and being able to leave when we wanted to without waiting around for trains and buses. We came out of the parking lot and I consulted my pocket map and we struck off towards the circular blob of buildings that is downtown Boston. After a bit of walking, we came out at the Bell building at Milk Street, and a lovely little square with seats, where we had a rest and some time to look at the map and get our bearings. Niamh decided she was thirsty, when she spotted a sandwich shop, so Karen bought her a bottle of water. As we sat and looked up at the buildings, the clouds grew darker, and it started to rain a little, so we got all our waterproofs and brollies out, and struck off across town towards Boston Common. The park was busy, and it started to rain quite heavily as we walked through it. 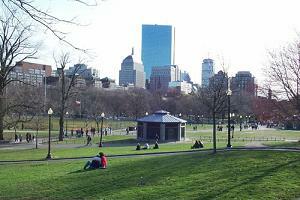 We crossed over the main common towards Beacon Street and it started to get a bit quieter. Eventually we came out onto the road and approached our first tourist spot of the day - the Cheers pub. The pub itself was closed, but we'd heard the interior looked nothing like the TV show anyway, so we had some photos taken outside of it and went upstairs into the souvernir shop instead, where we bought a couple of branded beer glasses and a beermat. Once out again, the rain had gone off, and we wandered back through the park towards the pond, where we saw that the famous Swan Boats were doing brisk trade, so we waited in line for them, and had a nice circuit of the pond. 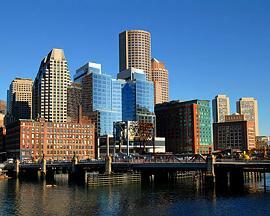 I was keen to see Boston Harbour, so we made our way back across town and crossed over the bridge. There was a massive amount of construction work going on, and the famous Boston Tea Party show was not there any more, though we saw where it was situated. Across the harbour was the Boston Childrens Museum, where we'd promised to take the kids. Once inside, it was obvious it was less museum and more fun park, very much like the Science Museum in Glasgow. The kids loved it, though we got more weary as our time there went on. Niamh loved meeting Clifford the Big Red Dog, and we got the usual moans and groans when we finally got to the end of all the exhibits. Outside it was almost lunchtime, and one of the tables outside became vacated just as we were looking for one, so we grabbed it, and I went to wait in the queue for the hot dog stand, and we had lovely frankfurters for lunch sitting by Boston Harbour. 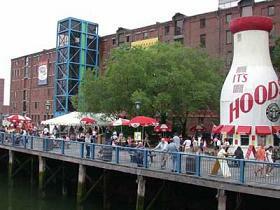 We walked back into town again, and towards the famous Faneuil Hall and Quincy Market, both large shopping areas. Faneuil Hall is where Sam Adams made his inflammatory speech, rousing the Bostonians into revolt against the British and effectively starting the war of independence. It was a shame that we'd already eaten, because there was a fantastic food hall there with every ethnic cuisine under the sun. We stopped outside and sat with drinks, and started to get a little bit sad that the holiday was almost over. The tiredness of the walking about and the change of mood made us decided we'd seem all of Boston we wanted to that day, and we made our way back to the car and back to the hotel for a rest. The feeling of the approaching end of the holiday was difficult to shake, and probably because of that, we decided to revisit something from earlier in the holiday. Instead of eating in Boston again, we decided to drive back to Cape Cod for the evening, and revisit Hyannis. The drive from Boston down through Plymouth took us to the Sagamore Bridge in under an hour and across onto the Cape. We drove into Hyannis and quickly located Ocean Street and had a look at the hotel we'd stayed at, which already seemed like a lifetime ago. We drove farther down the road to the beach area, that we hadn't had time to visit when we were there previously, and we walked along beautiful white sandy shore picking up shells. Niamh needed the toilet, when she saw the changing pavilion. Back in the car, we realised we hadn't actually been on the pointy bit of Cape Cod, and had seen precious few lighthouses on the whole trip. 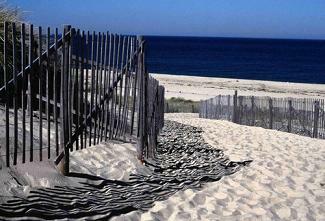 So we took a drive up the spine of Cape Cod, and stopped off at Nauset lighthouse for some photos. It started to rain quite hard, so we decided not to continue up the spine of the Cape, and instead go find the Friendly's we'd eaten at in Hyannis the week before. An hour later, we still couldn't find the place. We'd seen Bearses Way about a dozen times, and we no longer laughed that it looked like Bare Arses Way. At one junction, the traffic lights got stuck on red, and we had to jump them in the end just to get by. We were getting more and more frustrated with the place. When we were just about to give up, we found it, and we had another lovely, yet subdued meal. The holiday was coming to an end, this was to be the last proper holiday day of the trip, and it was almost over. We drove back to Boston quietly and went to bed.